Writing mindfully of the potency of the moment we find ourselves in, and given choices dark and murky, and false news instead of truth, any glimmer of illumination offers us hope. We can find renewal in the gathering of the desire and the will to kindness and collective caring in response to universal needs, and for collective opposition to well-recognized injustices, violence and increasingly brutal policies. Locally we have the opportunity to celebrate one of these points of light, emanating with warmth and compassion, from the life work of Ray Cunnington, and documented in his book “Towards Less Adversarial Cultures”. Ray’s life experience has given rich impetus to his focus on the capacity to cooperate as a fundamental human gift, and to forging his alignment with the United Nations initiative for an International Year for the Culture of Peace in 2000. Ray Cunnington’s book, with its tale of winding human progress, its history and its potential, is told from his uniquely qualified perspective, as a journey in search of peace, and if not peace, then of work that will carry us towards a more peaceful future. 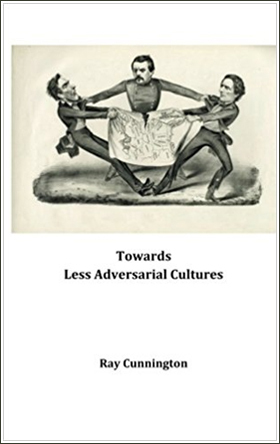 1 Cunnington, Ray, Towards Less Adversarial Cultures, 2016. p. 76.